11/18/2014- The Las Cruces Vaqueros took the next step in the returning when Pecos League Commissioner Andrew Dunn released the brand identity that will be used when the Vaqueros return to Las Cruces for the 2015 season. The team's logo, uniforms, hat and wordmark have been introduced. The primary logo utilizes the blue, mustard and black color pallete. It features a new aggressive-looking Vaquero that is ready to attack. It's distinctive V Cowboy hat, bandana scarf, brown glove and maple baseball bat let people know that the Vaquero is ready for business. The logo and design contains several odes to that of the original Vaqueros with its color combination and Western Look. "We developed a logo that is unique to our identity not generic as the original desparado/vaquero logo. It is a logo that is consistant with other Western Themed Logos in the Pecos League. We wanted to be different than the Las Vegas Train Robbers which many people agree have the best logo in the league. The Vaquero symbolizes the City of Las Cruces and the Western Tradition of New Mexico." said Andrew Dunn Commissioner of the Pecos League. 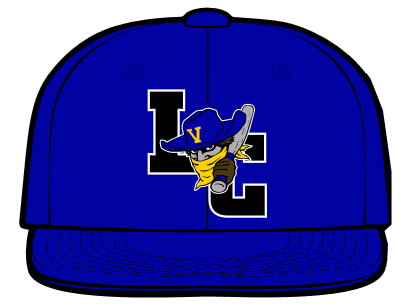 The Vaqueros Game hats will be Dodger Blue with Interlocking LC that is overlapped by the New Vaqueros Logo. The Vaqueros Jerseys will be Dodger Blue with Familiar three tone LAS CRUCES wording in white and black DEKKA DENSE Font. The New Mexico Flag and Pecos League Logo will be patches along with sponsor patches to be announced at a later date. The Vaqueros will wear white and grey pants. The powder blue pants will be saved for the 2016 season. The Vaqueros Gear is available online at http://www.LasCrucesVaqueros.com and will be available at all Vaquero Home Games.